Not only do bigger pieces better match the scale of surrounding trees and architecture, experts explain – they soften the harsh lines and defined spaces of hardscaping. We’ve seen a huge surge in container plants that aren’t just larger, bolder and more architectural, but easier to maintain. So how do you go about super-sizing containers? Here’s a step-by-step guide. First, evaluate your surroundings. 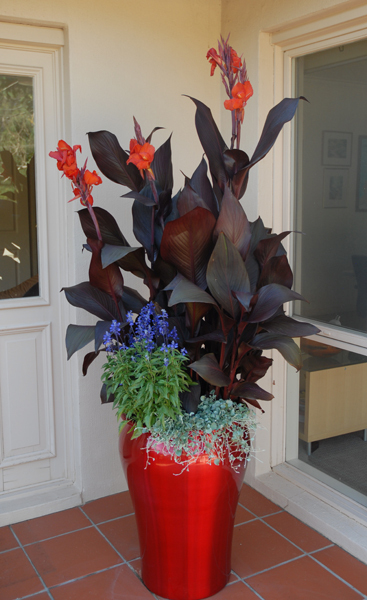 Groups of big planters are useful for softening edges and corners of large spaces. Singular, large planters can be used symmetrically at the corners of spaces to add height and boundaries that define architectural elements. Large bowls are being used more frequently as focal points or as companions to seating areas in outdoor rooms. And oversized containers can add an organic element against bare walls next to outdoor gathering places. When used appropriately, large containers can also direct traffic throughout garden paths. Framing your garden spaces with large planters is also a great way of incorporating color and interest as a trick to invite guests into the area. How tall should you go? A general rule of thumb, is to keep the tallest designs around the perimeter of a space and the lower ones around furniture and gathering spaces. 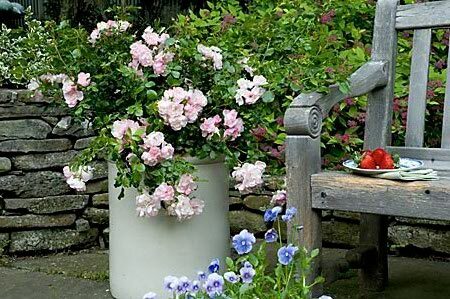 When it comes to the proportions of the designs themselves, devote one third of the height to the pot and the remaining two-thirds to the plants, or vice versa. Don’t get too worried about making your container garden too tall. People have more problems with achieving height than the other way around. It all comes down to learning from experience and developing your own idea of what’s aesthetically pleasing. Next, choose at least one plant that will give you the height you need. When you buy the plants to fill your containers, you really want to think in threes. You want something that spills over the sides … something that fills the center … and something that’s the ‘wow factor,’ or what some people call the ‘thriller.’ The ‘thriller’ is where you can bring in the height. In addition to cannas, bananas, alocasias and colocasias, include plants like papyrus, bamboo (for a fine-textured, organic, modern feel), daturas, fuchsias and abutilon. Another good idea is to use interestingly shaped conifers. Large containers can be beautiful with just one plant – or as many as you feel the design calls for. Using conifers in colder areas allows you to hold on to year-round interest. Alternately, you could use deciduous trees with charming bark or branching appeal. You can even use just the branches to extend the height of a piece. Large containers can serve as an exceptional extension of your food garden to reduce just a few more food miles. For large-container edibles, you can include artichokes, twining pole beans, tomatoes, cucumbers and even squash vines. Fruit trees and berry bushes or vines can also be used effectively in large planters. Try varieties of dwarf apples and pears, fig trees or raspberry plants as alternatives to ornamental plants in grandiose containers. If you have some wall space or arbors to cover, try grape vines in large planters. Be sure your container will be able to drain off excess water. If the pot doesn’t already have holes for drainage on the bottom, add them with a drill. For even better drainage, fill the bottom of the pot with rocks (or even sticks, shells and other organic matter) and then a soilless, lightweight potting mix. After filling the pot about halfway with the mix and working in a slow-release, granular fertilizer, pot the tallest plant first, loosening its roots. (If you put the tall plant in the center, the filler can go all the way around that and the spiller all the way around that. If you put the tall plant in back, the filler can go in front of that and the spiller in front of that). After the plants go in, add a layer of mulch on top of the soil to help hold in moisture. Larger plants also demand larger containers that can accommodate the roots of the plants’ ultimate size. Adding that a larger volume of soil can also hold more water, longer. At the very least, your container’s volume should be roughly a third to a half the size of the eventual volume of the mature plants.